Busy spring set to follow traditionally quiet winter rural property market. While it was a busy autumn, with plenty of farmland selling, market activity went quiet from June on, and we experienced a traditional winter. Farmers were preoccupied with calving and lambing, rather than transacting land. In recent years the rural property market has extended beyond autumn, with sales continuing throughout winter. Back before that, in the traditional market, farmers were disinclined to transact land while attending to more immediate farming activities was the priority. What we saw this year was a return to traditional patterns, with reduced market activity. This can mainly be attributed to the wet winter throughout most of the country, plus some uncertainty around the election. Statistics from the Real Estate Institute confirm what our rural property sales specialists have observed: 16.2 per cent fewer farms sold nationwide for the three months ended July 2017 compared to the corresponding period in 2016. However, prospects for a spring upturn are positive. In the traditional rural property market, a quiet winter is followed by increased spring activity, which should hold true this year. Given that the market was going through a low point, farmers have held off selling over the past two years, especially in dairy. With a more stable and positive outlook, many now see spring as their opportunity to move on. Others, meanwhile, are now looking to expand their operations and landholdings. Our rural specialist teams are experiencing increasing levels of listing enquiries from prospective vendors planning to go to market in spring. While the wet winter is holding things back, we expect considerable activity in October and November, with some notable listings in horticulture, sheep and beef, and dairy farms. Although the volume of farm sales dropped during the winter, values did not. Adjusted for differences in farm size, location and farming type, sales prices rose 5.6 per cent in the three months to July 2017 compared to the three months to June 2017, while rising by 9 per cent since July 2016. Our colleagues in the FruitFed division of PGG Wrightson report plenty of optimism in the horticultural sector, which is also evident from prospective investors in horticultural property. In the Bay of Plenty, in particular, demand for premium land continues to rise, with kiwifruit orchards selling at record values. Additional attractive listings are scheduled for the spring, and these exceptional values will continue to be tested. PGG Wrightson’s Livestock division also reports strong confidence among farmers, with sound export projections for sheep and beef. As a consequence, pastoral farms are in heavy demand throughout most regions. With listings of these properties relatively scarce, farmers that do go to the market in the coming months look set to capitalise. Provincial New Zealand has plenty going for it, with the economy performing well and the rural sector providing investors with a solid value proposition. What we can look forward to is increased market activity in larger properties this year, particularly in the dairy sector, where transactions of bigger farms have been scarce over the past few years as returns were less compelling. 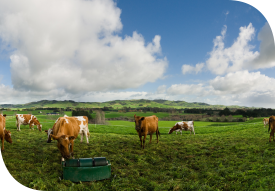 As the payout has improved and market conditions for dairy are looking up, an increase in property transactions is likely. Among those, we may see more corporate purchasers active again, and possibly transactions that attract the attention of the Overseas Investment Office. Most farm categories are likely to remain highly sought after through spring. Despite some notable listings, a supply-demand imbalance is indicated across the majority of rural property sectors. Perhectare values will therefore at least hold steady, if not continue edging up, as purchasers in all regions are likely to encounter a shortage of supply of the type of properties they are looking for. Whether you are buying or selling, doing so with an experienced, objective rural property specialist at your side will help ensure you achieve the outcome you are looking for. Wherever you are throughout the country, PGG Wrightson Real Estate is close at hand, and ready to put our deep, wide network to work for you. We look forward to your call.